(PR) (Trenton, NJ) All tickets for the 2010 Trenton Thunder season will go on sale to the public on Monday, February 1 at 9:30 am by phone, 609-394-3300, online at trentonthunder.com and in person at Waterfront Park. In addition, the Thunder announced today that ticket prices will remain the same as they were in 2009. Also, there is a high demand for seats when the Reading Phillies visit Trenton in July. The price freeze includes every seat in the ballpark, from reserve seating to the Yankee Club & Conference Center, group picnic areas and luxury suites, as well as all ticket packages including Season Tickets, Mini Plans and the choose-your-own 10 or more game Pic-A-Plans. The Reading Phillies, double A affiliate of the Philadelphia Phillies, will visit Waterfront Park for just four games in 2010, July 15-18. Last season, the Phillies visited Trenton for seven games that totaled 46,063 in attendance for an average of 6,580 per game. Waterfront Park’s seating capacity is 6,150. The July 15-18 games have been very popular choices for group outings and Ticket Plan sales so far this offseason. As a result, the entire R-Phils series is expected to be among the first games to sell out this season. “The fact that games six months from now are approaching sell out crowds really shows how excited people are for the return of Thunder baseball,” said Thunder General Manager Will Smith. Fans who would like to secure their seats for the Reading series prior to single game tickets going on sale may purchase a ticket plan before February 1. Two of the Phillies games are included in the six game “Rivals” Mini Plan. Fans may also include these games as part of a ten or more game Pic-A-Plan. Groups of 20 or more may also book their date now. Remember Greg Golson? Sure you do. Well, multiple outlets report that Golson was just acquired by the Yankees in exchange for Mitch Hilligoss. Hilligoss’ hitting streak in 2007 garnered national attention, but after two sub-par seasons at High-A Tampa, Yankees officials must have concluded that he was developing far too slowly for their liking. 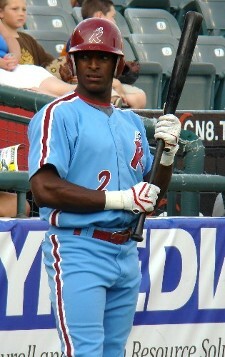 Golson came into Trenton as a member of the Reading Phillies in both 2007 and 2008. He entered the 2007 season as the Phillies 10th best prospect according to Baseball America. In 2008, he was ranked 7th. He went from playing in the Futures Game to becoming a very, very fringy big leaguer. As such, he’s likely slated for Triple-A Scranton, where he’ll have to play his way into a call-up. He’d pretty much have to blow the doors off the Yankees officials if he were to have any chance of cracking the Opening Day roster. Before 2009: Kontos was the Yankees fifth round draft pick in 2006 out of Northwestern. Assigned to Short Season-A Staten Island, he fared very well for himself in his first professional season, going 7-3 with a 2.64 ERA in 14 starts and helping lead the team to a New York-Penn League title. His seven wins were good for fourth best in the NYPL, and his 82 strikeouts were third best. Kontos skipped Low-A Charleston and went straight to High-A Tampa in 2007, and struggled at times, ultimately finishing with a 4-6 record and an ERA a tick over four. 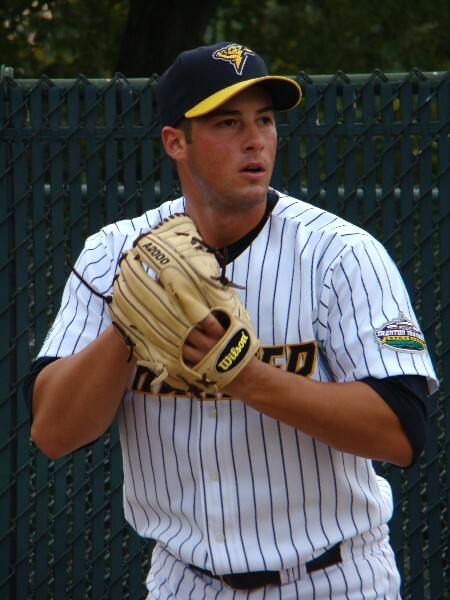 Kontos made Double-A Trenton in 2008, starting the season in the back end of the rotation. Plagued by inconsistency and a startling lack of run support in comparison to his rotation-mates, Kontos had another rough year by his standards, going 6-11 with a respectable 3.68 ERA in a career high 151.2 innings pitched. While he was in the top five in the Eastern League in losses, he was also third with 152 strikeouts and fourth with 27 starts. 2009: Kontos started the season determined to make it to Triple-A. I actually gained a lot of respect for Kontos at the beginning of the year…he made no secret of the fact that he felt like he belonged up there, and that was refreshing considering all the “you know, Mike, I’m just happy to be here and trying to help my team win no matter where I’m at” crap I tend to get fed. And after four starts in Trenton (1-1, 2.66), he got his wish. That wish lasted all of nine starts. He had some pretty rough starts, and some pretty impressive ones as well…but with the lack of quality rotation depth in Scranton, he at the very least had positioned himself for an outside shot at a call-up to the Bronx. Unfortunately, that never happened. Kontos was shut down in late June, and ultimately needed Tommy John surgery. After 2009: Kontos and I exchanged a few messages this off-season, and he’s very upbeat and positive about everything he’s had to deal with. While he will, most certainly, be back in 2010, it’s uncertain where that return will come. For the past two years now, Kontos has kind of been on the fringe of really establishing as a hot prospect in the organization. While the second half of 2009 and first half of 2010 will likely amount to one big lost year, a strong second half in 2010 at one of the upper level teams could go a long way towards establishing Kontos as one of the pitchers to watch in 2011. But I think it’s fair to say that expectations should be kept at a reasonable level for 2010. Touching on the off the field stuff real quick, Kontos was an absolute pleasure to cover. I remember it was the day after he thought he’d been traded to the Pirates, and he didn’t exactly pitch well in his outing…and you could see that he didn’t really want to speak to the small group of reporters that had gathered by his locker, but he collected himself and waved us into his locker and answered every question. Probably one of the more easygoing guys on the team, would always give you a minute to chat. (Trenton, NJ) On Thursday, the Trenton Thunder, Double A Affiliate of the New York Yankees, announced a schedule of daily promotions that will occur throughout the 2010 season at Waterfront Park. Kids Eat Free Mondays – Building off the success of the 2009 Kids Eat Free Every Game campaign, all children under age 12 will receive a voucher at the entrances for a free hot dog, bag of chips and a fountain soda at all Monday games. $1 Dog Tuesdays – Hot dogs will be just $1 each at every Tuesday night game. Wacky Wednesdays – Wednesday’s will be home to theme nights with activities being planned around that game’s common theme. The schedule of theme nights will be announced at a later date. Thirsty Thursdays – Every Thursday night game all season will feature a great beer special. Select Thursday nights will also feature post-game fireworks. Family Fun Fridays – Friday nights at Waterfront Park will feature giveaway items such as bobblehead dolls or on two occasions, post-game fireworks (May 7 and August 13). Fireworks Spectacular Saturdays – There will be fireworks after every Saturday night game beginning May 8. Kids Rule Sundays – Sunday games will have either a giveaway for kids or a kid-themed entertainer or special guest with the exception of the annual Dogs and Cats Rule Bark at the Park (April 25) , Mother’s Day (May 9) and Independence Day Fireworks (July 4). All children can also run the bases after Sunday afternoon games. Sunday’s are also “Kids Club” days in which all members of Boomer’s Kids Club receive a free ticket among a list of perks and benefits. Membership is just $15 per child and more information can be found at trentonthunder.com. The full promotional schedule featuring all giveaway items, quantities, age restrictions, celebrity guest appearances and more will be announced at a later date. Thunder Season Tickets, Half Season Tickets, Mini Plans and Pic-A-Plans for the 2010 season are on sale now by calling 609-394-3300 or visiting http://www.trentonthunder.com. All 2010 tickets will go on sale to the public on Monday, February 1 at 9:30 am. Trenton begins its 2010 season by hosting the Erie Sea Wolves (Double-A affiliate of the Detroit Tigers) on Thursday April 8th. Game time is set for 7:05 p.m.
Before 2009: Jason Johnson was in his 17th professional season when he put on a Thunder uniform. I’m not recapping the first 16. I will tell you that he entered 2009 with a 56-100 record in 255 MLB games with the Pirates, Rays, Orioles, Tigers, Indians, Red Sox, Reds and Dodgers. 2009: Words cannot do justice to what 2009 must have been like for Jason Johnson. He signed with the Yankees in the off-season with the hopes that he could crack the big league roster out of camp, and ended up wondering if he’d be losing vision in one of his eyes. Johnson was diagnosed with retinal cancer during spring training, and that derailed any hopes he had of possibly putting on Yankee pinstripes. 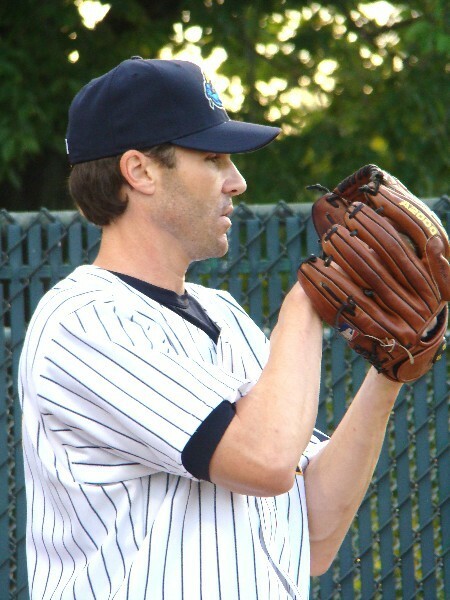 Johnson started 2009 in Scranton, and eventually suffered a partially torn labrum in his pitching shoulder. He tried to rehab the injury without surgery, and part of that rehab involved a two-game stay with the Trenton Thunder. In a sad example of foreshadowing, Johnson warmed up to Michael Jackson’s “Bad” prior to his only start at Waterfront Park. Unfortunately, that’s exactly what he was. He got rocked in his home appearance against Reading, and didn’t fare much better on the road against Erie. He ended up with an 0-2 record and 14.54 ERA with the Thunder before going back to Scranton and ultimately being released. While Johnson, a then-35-year-old veteran of 255 Major League games, didn’t stick around to chat with the media after his poor performance in Trenton, he was very gracious with us upon his arrival and with me personally on the day after that start…I think I was the only one who got to speak with him. Considering everything’s he had to overcome — diabetes since age 11, retinal cancer — it was very difficult to remain impartial and not root for him. After 2009: I’m not sure what Johnson’s plans are for 2010. At 36 years old, his 2009 season and with everything he’s had to overcome, I think it’s fair to say his future is certainly up in the air. Already the winner of MLB’s Tony Conigliaro Award, the fact that Johnson even pitched last year was a story in itself. But ultimately, it’s hard to get around the fact that he was tough to watch last season. Hopefully, his shoulder injury has recovered and he’ll be back on a pitching mound in 2010. Best of luck to him in whatever he does, he was a pleasure to cover. Before 2009: Hovis came to the Yankees after a run at North Carolina. All he’s done since is get people out. A reliever, Hovis started his pro career at Short Season-A Staten Island in 2006. In 25 appearancs, he went 5-1 with a 1.73 ERA in 25 games. It’s been the only season of his four-year pro career in which he hasn’t recorded a save. In 2007, Hovis was sent to Low-A Charleston, where he again was lights out. The righty went 4-5 with a 1.69 ERA in 55 games, and led the South Atlantic League with 30 saves. He walked just 11 batters in 64 innings of work, and his BB/9 ratio was second best in the SAL amongst relievers. 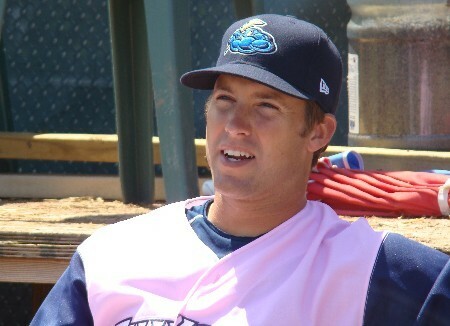 Hovis continued his logical progression in 2008, spending the season at High-A Tampa. Although he was shut down in late July, he still managed to post outstanding numbers, going 2-0 with a 1.14 ERA in 21 appearances, collecting 10 saves along the way. 2009: Trenton Thunder pitching coach Tommy Phelps mentioned Hovis by name on media day last year, saying that Hovis was strong in spring training and that he made an impression on him. So it was odd that the then-25-year-old would make only two appearances at the Double-A level, instead spending the majority of his 2009 campaign repeating Tampa. For the second time in his short career, Hovis would lead his league in saves, this time the Florida State League. He successfully closed out 22 games for Tampa, or exactly half of his 44 appearances. He went 2-2 with a 3.38 ERA for the T-Yanks, and his service with them was interrputed only by his mid-May callup to Mercer County. After 2009: I knew Hovis and Thunder manager Tony Franklin would get along when Hovis was clad in a hat with a golf club company’s logo on it upon his arrival in Trenton. Hovis and Eric Wordekemper seem pretty similar to me. Prospects that are lightly regarded by the organization and many who follow it, but guys who go out there and get people out with little fanfare. I’d be very surprised if Hovis didn’t start 2010 in Trenton. I literally only got to see him once, but I liked what I saw, and I’ll be curious to see what he can do over the course of at least half of a season. Having turned 26 just two days after Christmas, the clock is very much so ticking considering he, for all intents and purposes, has yet to reach Double-A. It seems to be a lock that, for the third straight season, a player will join the Thunder with some unnecessary off-season baggage. Brandon Laird, who hit .266 with 13 home runs and 75 RBI in 124 games at High-A Tampa last year and is expected to start 2010 in Double-A, was arrested at a Phoenix Suns basketball game along with his brother, Gerald, and another man. Gerald is the more well-known of the Laird brothers, as he’s caught in the big leagues for the past seven seasons with Texas and Detroit. Apparently, the brothers got into an altercation with security guards while at a basketball game. Laird joins George Kontos and Austin Krum as Yankees prospects to be arrested prior to joining the Thunder. Both of those were non-violent, bar-related incidents. Now, I’m not doing my job if I don’t report these things…but ultimately, who cares? Kontos and Krum were two of the nicest players I’ve had the opportunity to cover over the past few years, and I literally have never brought up either respective incident to them. I care about baseball, not stuff like this. I’d imagine things will be the same with Laird once he arrives at Waterfront Park.